We've arrived at the part where you actually put fabric back on to your sofa! That’s right, we’re finally here. The good news is that, on my end, this part is really easy. And on your end, it’s a little easy. But not as easy as mine. There isn’t really any bad news, because you’re about to have a new (old) sofa! It’s easy for me because, here’s the gist of this series of steps: trace what was on there before, cut it out, and staple it on. Let’s go through the steps, shall we? Now you’re looking at a bare sofa frame (or, in my case, one with foam still attached to the back), perhaps newly refinished. We’ll be attaching new burlap and material, in the opposite order in which we removed the old material. First, cover the springs with burlap. On my settee, this layer of burlap attaches, in the front, to the back of the bar that runs across the front of the settee (would you rather that I add more prepositions to that sentence? Around. Across. Behind. I can go all day). This means that the edgeroll will go on top of its front edge. 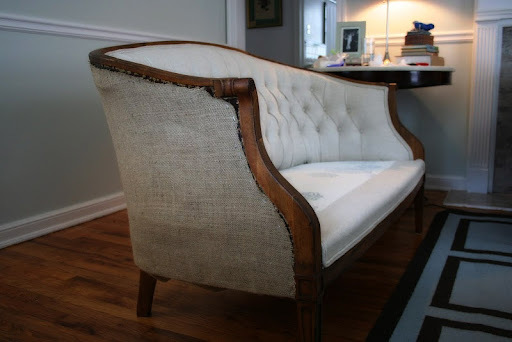 On the back and sides, this burlap attaches in the same way that the finish fabric will – it goes under the back of the settee, and is stapled to the outside of the bottom wood member. When attaching fabric, work from the center out. I put a staple in the center of the front bar, then two more on each side, about 3 inches apart. Then I went to the back of the fabric and did the same, and continued back and forth. Now reattach the edgeroll. I pried the old nails out of mine, placed it on top of the front bar, and used new 1-1/2” nails to reattach it. Be careful that it’s positioned the same way all the way across – it’s easy to move it forward or back very slightly, and by the time you’re done, the left and right sides are a quarter-inch off. You’ll keep working on the bottom until you’ve put in your finish fabric. Cover the burlap, from under the back bar, all the way to the edgeroll (I’m craving eggrolls) with one layer of cotton batting. Then lay on another layer, this one covering the edgeroll and coming down to just above the exposed wood. Here’s where you start tracing. You’ll need to make the piece of finish fabric that covers the springs, and which will be partially covered by the loose cushion. So you’ll most likely use a strip of your upholstery fabric on the front, and the rest of the piece will be less expensive complementary fabric. I thought it would be fun to hide a pattern under the cushion, so I silkscreened a chrysanthemum pattern, that I’ve used all over my house, onto some heavyweight white fabric I had laying around. Frivolity! The point here, and from this point forward, is to get the panels shaped as closely like the old panels as possible. Just trace, cut, and do what simple sewing you need to do. In this case, I cut my “hidden” fabric with too little excess, so I had to attach side panels. Then I attached my arc-shaped piece of exposed fabric. When I stapled this piece on, I folded the front over on itself by about a half-inch, so that the staples could grasp the fabric without, perhaps, coming loose in the fray. I found this to be unnecessary, and I stopped doing this for the rest of the re-covering process. Then I attached the back, in the same way that I had attached the layer of burlap below. On to the back cushion. As noted, I still had the elaborately-shaped-to-facilitate-tufting foam attached, which I knew I couldn’t replicate myself. Over this went two layers of cotton batting. I laid this on (friction keeps it stuck to the foam), and then tore off the excess around the sides of the cushion. Tearing gives batting a gentler edge than cutting does. With my finger, I poked the batting into each of the tufting holes. I stretched out the old fabric panels from the back cushion, pulling out the tufting pleats, and traced the shape, giving myself a few extra inches on every side. The back actually comprised three separate panels – a long center panel, and two shorter panels that curve around to become the sides. If you’re tufting, here is where the challenge comes. You’ll have to staple the panels at the top and bottom, and simultaneously tuft as you go along. I put five center staples at the top of the fabric, just under the exposed wood. Then I got to tufting. Take your button, and loop an 18” piece of nylon tufting twine through the back loop. Then take both ends of your twine, and feed them through the eye of a long, straight upholstery needle. Poke the fabric down into the tufting hole, pulling it taut down from the top, where you just stapled. Now insert your needle, and push through to the other side. Check the back of the sofa to make sure that the needle came out through the hole you marked earlier. Pull the twine as tight as you can, and take a small strip of fabric, or a clump of batting, and tie a square knot around it with the twine. Since both sides of the twine are coming out through the same place in the fabric, it needs something to hold onto in the back. Do the first couple of tufts on the top, center positions. Then work down to the middle row of tufts, then finally the bottom row. All this time, you’ll need to be thinking about your pleats. All my resources indicated that pleats sort of made themselves, a natural result of fabric being bunched in certain places. This didn’t happen for me, and that may be because my fabric was too flexible and had too much stretch (which is why I noted in the previous post that I perhaps should have attached fusible interfacing to these panels, too). So in my case, I had to form the pleats manually, forming three minute folds around my first button, and moving out from there. Form your folds downward, so they won’t collect dust. It’s tedious, and it’s frustrating. I cut out many a button when the pleats hadn’t properly worked out. But you can do it. When you’ve put in a button on the bottom row, stretch the fabric taut at the bottom, and staple it to the bottom framing member, directly over the fabric that covers the seat. Keep working your way out. The intersection of the different fabric panels was a challenge. I took my original three fabric panels and laid them on the floor together to see where the side panels took over – at the fourth button from the center, the same on each of the three rows. I laid down the two side panels, overlapped by the center panel. Then I figured out where each button would go, and trimmed the center panel in a zig-zag based on these locations, leaving an inch of excess. I folded over each of these edges, formed the necessary pleats on the center panels (the folds would take the place of pleats on one side), and put in a button. 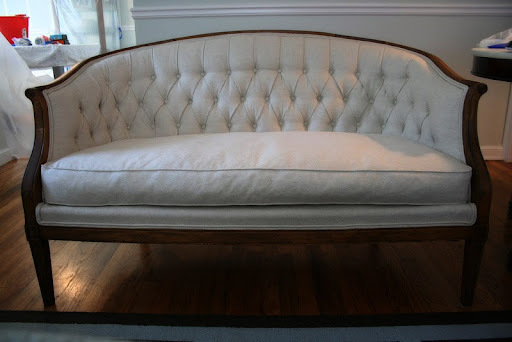 When you’ve finally attached and tufted all of your fabric to the back cushion, trim off the excess, keeping very, very close to the exposed wood. If your piece has a loose cushion, it probably had clips to keep the cushion in place. Reattach these, or make new ones using new elastic and the old clips, and staple them in at their former locations. I almost wanted to leave the settee like this, a deconstructivist ode to burlap. Alas, Allen requested fabric that wouldn’t shed on the floor or make us cough. But wouldn't it look kind of great, if you folded the burlap over at the edge, and attached it with tacks, instead of staples? No? Fine. Turn your sofa over so it lays on its front, and lay a layer of batting on the back and sides. Staple around the edges, and trim the excess. The next part will be so easy, now that you’re a tufting pro. Take your back fabric panels, and staple them to the edge, very close to the exposed wood (you’ll only have a narrow strip of double-cording to cover these staples), working your way from the center, going from top to bottom, top to bottom, stretching taut as you go. If you’re using 3/8” staples, as I did, you may have a little trouble on the bottom, where you’re layering finish fabric over batting, burlap, and jute webbing. Use tacks in these places if you need to. Once you’ve trimmed all the excess as closely as possible to the exposed wood, you can attach your double-cording, and cover up all those staples. I used a hot-glue gun, and despite bravely sustaining some very minor burns, I think hot-glue has an advantage in its instant adhesive properties. For the inside trim, tuck the end of the cording between the side-panel fabric and the seat-panel fabric, and start gluing. Sharp turns of the cording will be difficult if the cording is thick, as mine was, and you may be able to spy a little corner of bare wood. Oh well. Imperfections were obvious at the bottom edge of the sides and back, as I had stretched the fabric over soft cotton batting, and then over an irregular bottom with staples and webbing on it. Double-cording is really supposed to be applied at the edges of fabric and exposed wood – its job is to cover staples – and here the architect in me reared its ugly head. Double-cording isn’t supposed to go at the bottom edge of the sofa, where the fabric just turns a corner; applying it here breaks with the logic of its use. But the bottom was so dimply and irregular that it needed some kind of edge, so I decided to use it – good thing I bought a couple of extra yards. I love the result. And so far, no one has walked in and said, “Hey – the trim on the bottom edge is at odds with the parameters set up by the rest of the sofa!” I think it will be okay. Next time ... making the cushion (open a bottle of Tylenol). This is amazing. 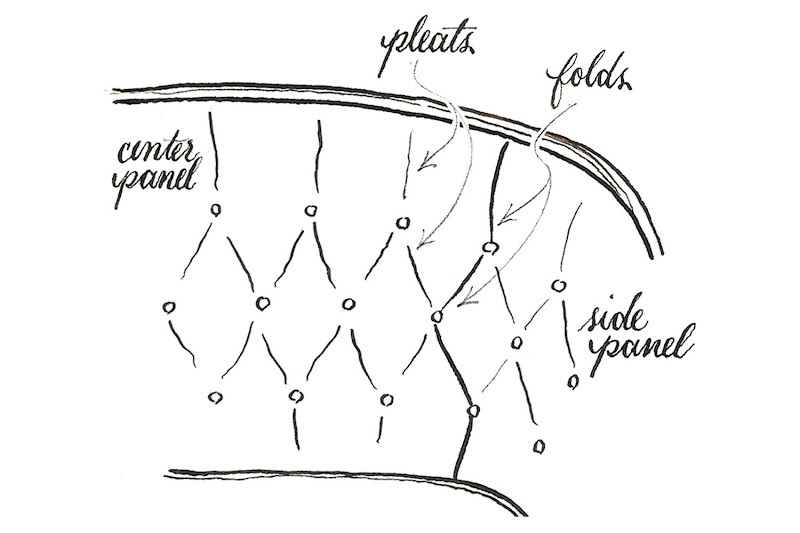 Thank you for excellent diagrams throughout the upholstering process. Beautiful results! I've been looking for a step-by-step upholstering guide for a while, and this looks sooooo awesome! Thank you so much for sharing! Really sure a wonderful you did. Like this I also have a chair but it was not now if I see this post before I definitely do this remodeling work on that chair. I wonder whether the pleats not bunching up a lot and "making themselves" was due to using the original foam. Depending on how old it was, the foam would have lost some of its springiness, and I think that the hills-and-valleys shape it has in pics might be the shape it acquired when tufted: it was compressed over time by the fabric stretched over it so it doesn't bounce back any more. But a sheet of new foam will push up against the fabric, making it pucker and pleat. That's my theory, but I stress: I know nothing. Just a reader full of admiration for your work! That includes the gorgeous line drawings. Love the chrysanthemums, which you screen printed! Is there no end to your talents? And I have a question: is it difficult to keep stapling layers of burlap, batting, more burlap, fabric, etc. over the top of each other, all close to the edge? I have an image of a traffic jam of staples all crashing together on top of each other, which obviously doesn't happen, but why? And doesn't the timber object to so many holes? Finally, thanks again for the fascinating posts. It looks so professional! Very impressive.